Though I mostly enjoy my car-free life, I do wish I skied more. When I lived in Idaho I thought nothing of 100-mile drives to support my season pass at Schweitzer, and when I lived in Colorado there was always the Ski Train to Winter Park. Our wilderness legacy in Washington has kept our spectacular mountains fairly well-preserved, with the caveat that the relatively few access points that do exist must be accessed by car. Here we have resorts surrounded by emptiness (whether wilderness or clearcuts), whereas places like Colorado have ski towns, many of them served by comprehensive (and free!) transit service. Though Washington has an impressive amount of rural transit, very little of this serves our resorts. Our decision to under-develop our mountains comes with environmental benefits that I genuinely appreciate, but this particular tradeoff – lack of transit access – frustrates my attempts to enjoy winter sports and still live car-free. Though Zipcar, traditional car rental, and Craigslist rideshare are good options in a pinch, I thought I’d write a post laying out our options for getting to our ski resorts car-free. 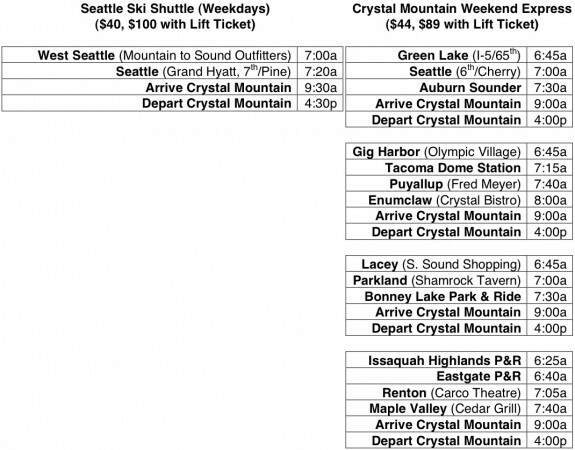 Crystal Mountain: The Ski Shuttle operates on weekdays only with stops in West Seattle and Downtown Seattle before running express to Crystal. The Weekend Express bus operates on Saturday, Sunday, and select holidays. Buses originate from Green Lake, Gig Harbor, Lacey, and Issaquah. Summit at Snoqualmie: Weekend service is available from West Seattle and Downtown Seattle. Night Skiing service is offered on select Tuesdays and Thursdays. Stevens Pass: It is difficult to get to Stevens Pass without driving at least some distance. Northwest Trailways will take you directly from King St. to Stevens Pass, albeit with an arrival of 11:40am, a bit late for beginning a day of skiing. Daily bus service is also available from Leavenworth, making a 2-night vacation doable via Amtrak. 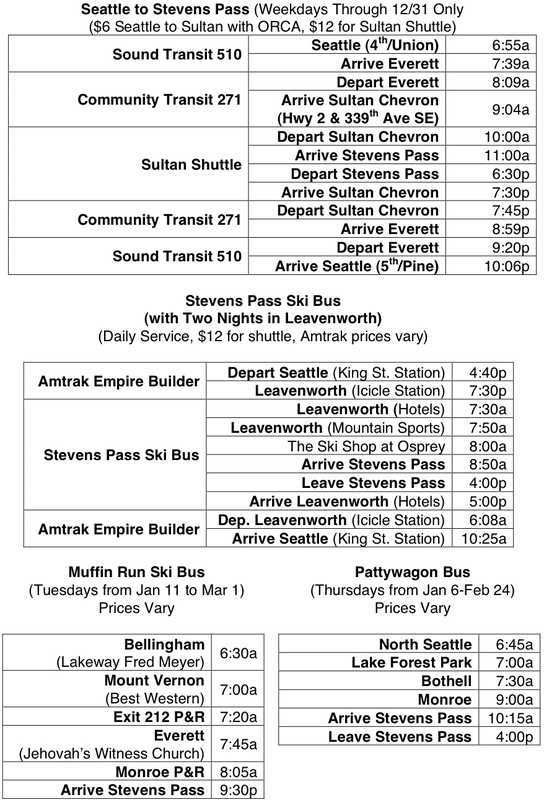 The Sultan Shuttle runs from the Sultan Chevron to Stevens Pass, with 3 departures each Saturday and Sunday. Community Transit runs hourly service to Sultan on Saturdays, but a connection between the two is not possible due to timing. Through New Years’ Eve ONLY, weekday Sultan Shuttle service is offered, making a Community Transit connection possible. Otherwise, there are several occasional shuttles, a list of which can be found here. 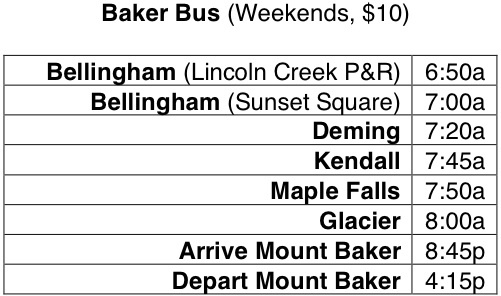 Mount Baker: Weekend service is available from Bellingham on the Baker Bus. There is no service from Seattle, and no buses/trains connecting to the service. The bus departs from Whatcom Transit’s Lincoln Creek P&R. Mission Ridge: Wenatchee may have the best ski/transit access in Washington. The local transit agency, Link Transit, runs 6 trips per day on weekends and holidays, with substantial midday service (likely for resort employees). Most trips originate at Columbia Station (Amtrak), and regular fares ($2 each way) are charged. 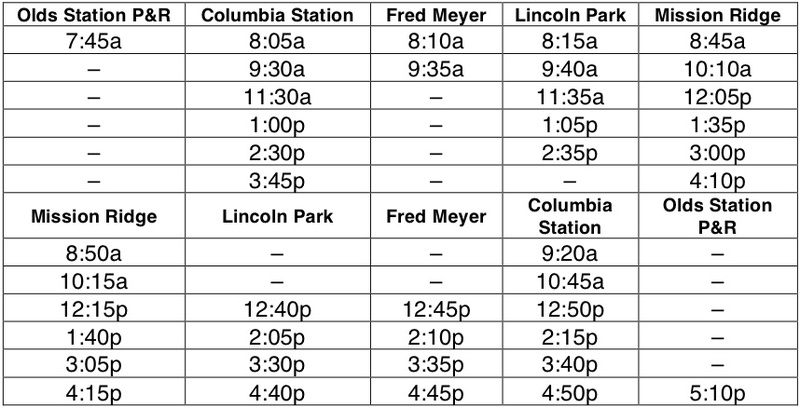 Passengers coming from Seattle to Wenatchee have a choice of a 12:55p or 7:00p bus arrival (Trailways), or an 8:42p train arrival (Empire Builder). If Wenatchee is within this scope, then so might Cascade service to Grouse Mtn. From Central Station, take Skytrain to Waterfront, Seabus, then Translink #236 to the lift. Hotels available via 236 on Capilano Road, or grander ones downtown. There is also significant bus service to Whistler. From Central Station, Greyhound has 6 daily trips, while Whistler Express has 10. Grouse also has night skiing too. If you want to find inexpensive places to stay in downtown Vancouver, consider staying at a hostel. There are some hostels located around the train station. Another option would be the YWCA in Yaletown. Just a couple of cheaper options. For Stevens, an Eastbound morning and Westbound evening Seattle-Spokane train would work wonderfully, with a new station either in Skykomish, or just before the entrance to the tunel, Stevens would provide bus service up the hill, scheduled to match the train arrival/departure. Abandoning the MILW Pacific Division is perhaps one of the most short-sighted things that has happened in the history of Western Railroading. I really wish either the BN or UP had bought the tracks from the MILW. The BN did buy the former MILW line over Snoqualmie Pass. Then they scrapped it. While not in Washington, there is Amtrak Empire Builder overnight service to Whitefish, MT. Interesting outfits on the ladies boarding the train. The fashion statements and ensembles we see in downtown Seattle would amaze even the most jaded fashionista – insane and impractical at once. Good post. A lot of people justify hanging onto their cars, saying they need it to go skiing, or need it to drive up to trailheads to go hiking, etc. Thanks for showing us how easy it is to still do these activities without a car. We could also simplify the situation by giving zipcar spots at transit centers that are in the suburbs. That way, you could take, the 554 to Issaquah, and then rent a zipcar to Snoqualmie. The directions for getting to Stevens is way more complicated than it needs to be. Just use Trailways from Seattle Amtrak, Seattle Greyhound, Everett Station or from the Monroe (http://www.northwesterntrailways.com/CurrentTimeSchedule/tabid/220/Default.aspx). There is daily service. You need to purchase your tickets in advance as Stevens Pass is an on-call or flag stop. I didn’t realize they had a flag stop there, thanks. Added. I checked the fares – it’s $46 roundtrip from the Northwestern Trailways website. I also checked on Amtrak for January 9 and it was wanting to sell me a round trip for $38. If we are going to include Grouse Mtn, Whistler, Scheweitzer, and Whitefish, surely we could include Mt Hood Meadows. There is a bus that picks up at the Tualatin Transit Center, near Sunset TC, and near Gateway TC. Trip is $79 and it includes your lift ticket. One could easily take Amtrak Cascades down to Portland, overnight, and then take the MAX to either Sunset or Gateway to connect (I recommend Gateway). Take 509 south on a Friday, Ski on Saturday, and then one could take 500 home on Sunday and still get their chores done. Disclaimer: I drive the bus up! Come ride with me! Thanks for adding this. I was hoping commenters would include additional links, as I only posted the ones with which I was familiar. You know this brings up a great point. Use the trains and buses that we have right now to get around the Northwest. I have one friend who is attempting to take Amtrak this weekend to Mission Ridge near Wenatchee. Just two weekend’s ago, he and his family took Amtrak to Leavenworth for a Christmas weekend there. If we leave the cars at home and at least make an attempt to use the buses and trains we currently have at our disposal…maybe (just maybe) with higher demand, there will be more service in the future. Did your friend use the special train to Leavenworth, or the Empire Builder? Patronizing any extra service may assure that it’s there in the future. I plan to take the only bus out of Okanogan County next week. The special train to LWA was a roundtrip charter operated by Amtrak/BNSF for Alki Tours. I do not believe one way Amtrak fares applied, per Alki’s brochure. Nonetheless, it IS a good idea to patronize those tours as they can be fun, esp for families, and the equipment used for them allows the Thanksgiving/Christmas extra trains between SEA and PDX. They actually took the Empire Builder and it was pretty full. According to the conductor, the long distance trains fill up fast in the fall and winter. Funny, my neighbor hates to fly and she always takes the Coast Starlight on her annual 3 week (she’s a teacher) Christmas trips down to L.A. and feels the train ride is half the fun. Amtrak LD trains actually have a really complicated peak travel pattern. On the whole there’s more travel in the summer than the winter, but there’s also massive travel around Thankgiving, Christmas, and New Years. The lowest-travel month is February. The Empire Builder, however, fills up year-round. I just noticed the $6 fare from Seattle to Sultan with ORCA. Shouldn’t that be $3? Doh – round trip fare. Never mind. #618 from Fauntleroy, Hiawatha Rec Center and Sicks Stadium. #612 from Bellevue, Renton/Cedar River, Maple Valley and Emunclaw. #614 from Seattle Center P&R, UW, Northgate P&R, and Bothell. #616 from Belleuve/BCC, Bellevue/Kirkland P&R. All Coaches arrive at 9 Am to the ski areas and Left at 4PM. in 1974/75 The 602, 604, 606, 608, and 612 were the only ones running. From the 1974/75 schedule: “Metro’s Popular Hot Dog Limited Ski service will take you and your gear to some of the best skiing facilitys in the Northwest without the hasles of putting on tire chains or the long drive home after a vigorous day of skiing. Relax, Talk to your friends, or lean back and get some sleep. Metro is offering 4 diffrent routes to the ski areas at snoqualmie pass (Alental, Hyak, Ski Acres, Summit), one route to Crystal Mountain and another route to Stevens Pass. Buses will leave from convient park & ride poitns every saturday and sunday from December 14th through March 23, 1975 includeing Feb. 17. The Round trip fare is $6.00 to Snoqualmie pass, and $8.00 to cyrstal and Stevens. There are no one way fares. Can I get a combo ORCA/Crystal Mountain GO RFID card yet? Q: What About RFID & Pacemakers? Answer: Electronic devices (e.g. radio units, mobile phones, security systems, etc.) create electromagnetic waves of different frequencies and intensities. These are caused by the design of electronic devices and therefore in most cases cannot be avoided. Unfortunately, these waves sometimes may also lead to an undesired impairment of other sensitive electronic devices. *Guests with pacemakers must not wear their lift access media cards near the heart when passing through the gate and a distance of 8 to 12 inches should be observed in the case of queues and while passing through the gate. *If you prefer not to pass through the gate, please alert our validation staff at the lift and you will be given alternative direction for lift access. So can I infer that ORCA cards will kill people with pacemakers? There’s no doubt in my mind – those young ladies, including blondie, are from Japan. Several years back, I remember an expat Japanese team at the Dragonboat Festival in False Creek – girls in high heels and miniskirts, guys in colourful headbands and jeans, someone sparking up a j(!) pre-race. A total WTH moment. And one of the reasons I love Japan to pieces!! Sorry for being OT.